FPA has been acting as the trusted advisor providing computer support and related technology services for Registered Investment Advisors for over 25 years. 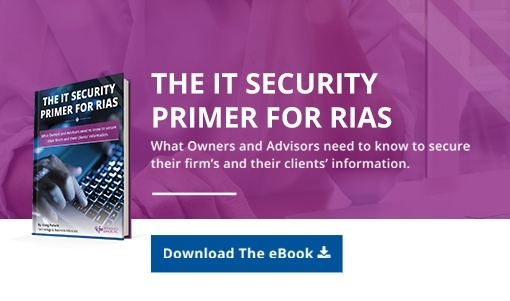 We know investment advisors live and die by their ability to access timely, accurate, and secure information within their computer systems. Having an IT Service Provider who is intimately familiar with the operations of your specific business from top to bottom is critical to making this happen and FPA is committed to being this partner. We understand the operational considerations of running an RIA. FPA provides early morning support when the market first opens. We schedule critical network and system upgrades for off hours so network downtime is kept to a minimum. We understand the implications of pricing, trading, billing, confidentiality and compliance working closely with audit partners to meet SEC and FINRA compliance requirements. We have developed custom programs and reports (both within Portfolio Management systems such as Advent's Axys as well as externally) to help provide that critical information that our Investment Advisor clients need. FPA has experience implementing Windows servers, workstations, and related network connectivity to run various Portfolio Management systems. We have the know-how to optimize the configuration of the workstations to install and configure the specific software (Axys, Tamarac, Portfolio Center, etc. ), and to configure the server to specifications of investment advisor applications (Advent, Schwab, etc.). Our understanding of the business flow within the Portfolio Management office enables us to better serve our clients. We understand the inner workings of trade-blotters, audit trails, and Custodial Interfaces. We also know how to configure 3rd party software to properly integrate with the Portfolio Management system. FPA has invested heavily in our own infrastructure to provide proactive management, maintenance, and support that Investment Advisors require. Through our Network Operations Center (NOC) and dedicated in-house Helpdesk we provide enterprise level service to our Investment Advisor clients. Our approach to computer support services is relationship based - we focus on our Investment Advisor clients ensuring that support is fast, efficient, and effective getting them back to work asap. FPA has specialized in working with Investment Advisors in the LA area for 15+ years. Contact us and we can walk through how we can help and review any questions you may have.